I was sleeping at a friend's house that I had never been to. We were planning on holding a paranormal investigation because of some strange goings on there. We never ended up doing the investigation because my friend's husband did not want to disturb the deceased, as one of the entities believed to be in the house was his brother. Instead we had a glass of wine and watched a spooky movie before heading to sleep. I was uncomfortable on the couch so I moved myself to the floor. It was a thick and very comfortable carpet and I had plenty of blankets and pillows to keep me comfortable. I'm not sure what time it was but I was awoken in the middle of the night. I was on my stomach, so I lifted my head up and started to look around and there was nothing in sight. All of the sudden it felt like someone crawled on top of me from the neck down. I could still move my head but not far enough to see if there was actually something, or someone, on me. I couldn't move a muscle from the neck down and my friend was sleeping soundly right next to me. Does this sound like sleep paralysis, or was there a paranormal entity actually on top of me? I never did snap out of paralysis, I just went back to sleep. I have experienced this paralysis before immediately upon waking up in the middle of the night, which definitely leads me to believe it was in fact sleep paralysis, however, one time was different. I woke up and my entire body was paralyzed. The only strange thing that coincided with this event was the fact that someone was pushing down on my pillow.. but I was alone in the room. It felt like two hands pushing down on the pillow and they went all around my head in a circle. Is this something that carried over from a dream and I was just experience residual effects after waking up? I don't think I'll ever know! Kevin: Hey Karin, thanks for sharing your experiences. 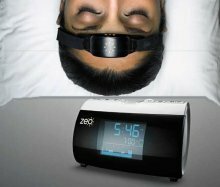 What you describe does sound like sleep paralysis in both cases, and I think you're right on the money when pointing to residual dream effects to explain the sensation of feeling two hands pushing down. Sleep paralysis is very tightly linked with dreaming, since the atonia that causes the paralysis stems from REM sleep, the period of the night when most dreaming occurs. As a result, things like hypnagogic hallucinations often coincide with episodes of sleep paralysis, making for some pretty terrifying experiences for some people. 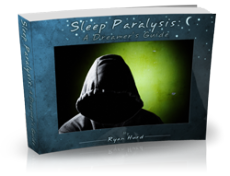 You can find out a lot more about this relationship of dreaming and sleep paralysis by reading some of the other visitor submitted sleep paralysis stories on this site. I read your story and was wondering if you have other symptoms. Such as excessive daytime sleepiness, insomnia, cataplexy? Cataplexy is muscle weakness or total body collapse. This usually happens when experiencing a strong emotion such as laughter, being startled, or even stress. The reason I am asking is because I suffer from narcolepsy and sleep paralysis and hypnagognic hallucinations are two symptoms of narcolepsy. I would Google Epworth Sleepiness Scale and take that short questionnaire. If you score relatively high I would consult a sleep doctor. If you'd like more info contact me on FB. My name on their is Kim Mackie. I am from Des Moines, Iowa. My profile picture is of my grandson and he's wearing a Iowa Hawkeye shirt. Just friend me and leave me a message that you are from this site and I will accept your request.